Established in 1918, The Kew-Forest School is celebrating its centennial this year. We are the oldest independent, coed, college preparatory school in Queens for students in Preschool through Grade 12. With more than 255+ students, 60+ nationalities represented on campus and 25+ languages spoken at home, our school provides a safe, nurturing, and intellectually vigorous environment. 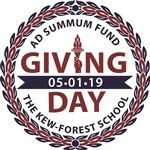 Support The Kew-Forest School's Ad Summum Fund on our first Giving Day - Wednesday, May 1, 2019. Looking for a Valentine's Day date destination today? Check out the newest Rebel Wilson film, Isn't It Romantic, directed by Todd-Strauss-Schulson, Kew-Forest Class of 1998.